When you add a new drop-down or multi-select ticket field, you may have a large number of field values to include. For example, a new field that lets agents choose a software version or product type might include hundreds of choices. Rather than add field values manually one at a time, you can add many field values in a bulk import. You can also export ticket fields and values to archive or use in other applications. 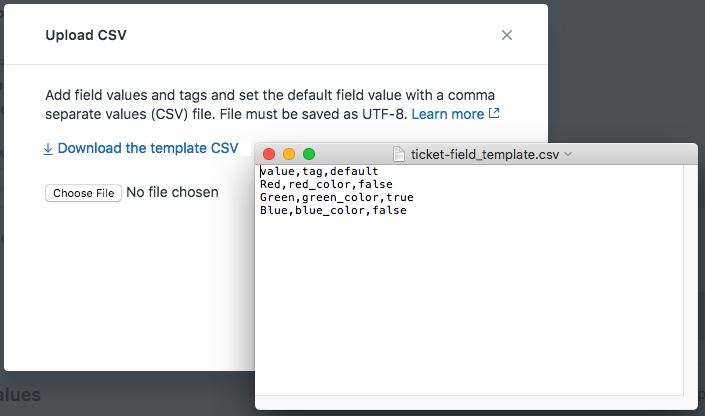 Before you import, create a CSV (comma separated values) file that contains the ticket field values you want to add to a new ticked field. You can download a template CSV file and use it as a model for adding your own field values. See example below. The following table lists the fields to include in the file. The first row of the CSV file is the header row, and you must include it in the file. value Value that appears in the drop-down or multi-select field. tag Tag associated with the field value. The tag is used as a ticket property that can be included in triggers and other business rules. default Identifies the default value for the drop-down or multi-select field. Use true to identify the default value. Use false for all other values. When you create a list of field values to import, you'll probably generate this list of values from some other ticket or product management system. Most of these systems have some facility for creating a CSV export file. If you need to create the list from scratch you can use a program like Microsoft Excel or Google Sheets. The file must be properly formatted CSV and saved using UTF-8 character encoding. The import CSV data file must contain no more than 3,500 rows of data (one row for the header and the rest for the field values). After you create the CSV file, you can import these values into a new ticket field. Navigate to Manage > Ticket Fields to display a list of ticket fields. You can only bulk import values for new ticket fields. You cannot import field values for existing ticket fields. Choose the type of field you want to create (Drop-down or Multi-select). You can only import field values for drop-down or multi-select fields, CSV import for other types of fields is not supported. In Field values, click Upload CSV. Click Choose File and open the CSV file you want to import, then click Upload. Note: If you prefer, you can Download the template CSV file to use as a model to prepare your CSV file before you upload it. When you successfully upload the CSV file, Field values are updated to include the new data. Finish adding information about your new field, then Save your changes. For more information, see About Ticket Fields. As your list of ticket fields and field values expand, you may find it useful to export ticket fields and values to a CSV file. For example, you may want to use the CSV file as a checklist to verify that the latest product types or software versions are available for your tickets. Navigate to Manage > Ticket Fields. Select a Drop-down or Multi-select field. In Field values for the ticked, click Download CSV to export a list of values in CSV format. Click the download icon (next to the Add Field button) to export a list of ticket fields in CSV format. The exported file includes the following information for each ticket field: Title, Field ID, Field Type, and Date (when the field was last modified). See example below. The file is ready to open in spreadsheet applications, like Microsoft Excel or Google Sheets, for further processing. Note: Before exporting, you can update the ticket fields list by filtering results or changing columns (adding, deleting, sorting). Only the columns and fields that appear in the list are exported. Really helpful! We were just talking about creating a new dropdown field but it would have hundreds of options. You mention the file can't contain more than 3500 fields. But is the Zendesk dropdown limited also? Meaning, what is the max number of drop down options we can have for a field? Thanks for asking! The 3,500 limit refers to individual options on a single drop-down or multi-select field, not the cumulative number of values across all the fields. You could have as many as 3500 options in a drop-down or multi-select (minus 1 row for the header) for a total of 3499. If you are talking about hundreds of options in a drop-down fields you should be well under the limit. Thank you for the info, Lisa! Just to clarify. 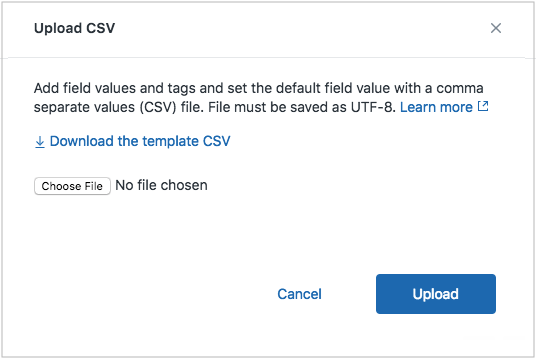 Creating a field via CSV upload is limited to 3,500 values, If you need more than 3,500 values, you can add them manually or use the API. I noticed the CSV cannot use "," formatting as it will just move the value in it. Additionally, if the headers are put into "value","tag","default" it will fail import as well. Is it possible to get the quote formatted CSV? I have a text string that has commas in it that comes from a reference and it would be nice to not manually parse it. Unfortunately that is not a feature of our system at this time. Additionally, I am unaware of any feature additions on the roadmap by our Dev team to add this feature at this time. However, if you would like to post in our Product feedback forum, our Dev team regularly goes through and reviews posts looking for opportunities to update our platform for the benefit of our users. If you do post, please make sure to leave a detailed workflow use case as this will help them work out how to best add the feature to the platform. We have a field with a list of distribution lists used within our organization. One of our forms is for new hires and the idea is the HR manager selects which DL the new hire should be a member of. Since there is a limitation here that only lets you import the CSV file for "New fields", how would we be able to import these values or update the list of values for existing fields? 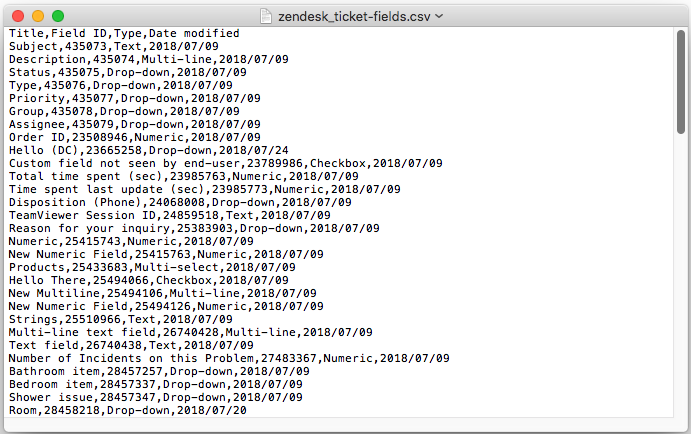 You would be able to update the ticket field values by using the Tickets API endpoint, https://developer.zendesk.com/rest_api/docs/support/ticket_fields#updating-drop-down-field-options.